Tale of two countries: How a celebrity and a commoner stood up for their personal ethics. 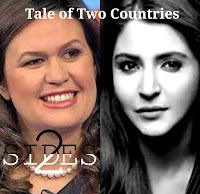 HomeTalesof2Tale of two countries: How a celebrity and a commoner stood up for their personal ethics. A few days before, India collectively gasped at the civic sense and dedication of a public figure. Anushka Sharma Kohli, an ambassador of Swachh Bharat Abhiyan- an initiative by Indian government to keep the nation clean- scolded a man for littering on the road. Her husband and captain of Indian Cricket team, Virat Kohli, promptly filmed the incident and posted it on social media, without concealing the defaulter's face. The video shows Ms.Kohli asking the man to scroll his car's window down, after which she gives a brief lesson on how to dispose waste in a dustbin. The man looks lost for words, and without further incidents the video ends. The video was watched by millions, merely hours after it was posted. In the description of the video, Kohli slammed the "man in the luxury car" and explained how "his brains had gone for a toss". Twitterati polished their detective skills and sniffed out the shamed person's identity. The day after, Arhan Singh, the litterer, hit back at the couple, saying that more trash came out of the actor's mouth than he had 'accidentally' put on the road. His mother and family too came forward to stand by him amid all the finger- pointing. In the aftermath, social media divided and accusations were volleyed back and forth between the sides. Arhan Singh has now initiated legal proceedings against the pair for maligning his name. While the Bollywood actor's intent was good, the intonation was widely perceived as rude. It needs to be said in this context that they are the desi 'power-couple'. What they say, or do, receives wide attention, and they should have been more careful on how to express their views. By choosing not to protect the identity of the 'wrong-doer', they have put themselves in a tight spot. Sanjay Jha, a politician from Congress, has accused the couple of 'seeking attention'. The love for limelight and the intended moral lessons can't justify the violation of the man's privacy. A week later and 13000 kilometres away, in a city of the United States, a group of eight arrive to dine at Red Hen, a non-descript restaurant. The employees instantly recognise one of the guests as Sarah Huckabee Sanders, the press secretary of POTUS( President of the United States). Lexington, the place where the restaurant is situated, had voted against Trump in the presidential elections. And unsurprisingly, the owner of the restaurant, Stephanie Wilkinson, was no fan of Donald Trump's "inhumane and unethical" administration. Sanders, being the face of Trump's controversial and inconsiderate policies, put the owner in a moral dilemma. Some employees of Red Hen were homosexual. And the Trump government had offended them with 'anti-LGBT' policies. They often saw the guest doing her job- which is to defend Trump's policies on TV. Naturally, seeing her in person does not please them. Wilkinson quickly makes up her mind- she politely asks Sanders that she leave, adding that the restaurant staff had a moral code to fulfill. Sanders graciously agrees and leaves the restaurant without creating a scene. Though the other guests are welcome to continue the dinner, they choose to accompany her. The restaurant doesn't accept any payment, saying that the meal is on the house. The incident came to light when one member of the staff posted on Facebook. Again, the social media divided and people stood for and against the restaurenteur's decision. What has to be learned from the incident is that people can stand for their ideals without being bossy or rude. May the Kohlis learn from Wilkinson, as to how one should do so. It could be argued that the fear of confronting a powerful citizen was the reason Wilkinson was polite and quiet. There is nothing, however, to suggest or contradict that statement. Arhan Singh could learn to own up to his mistakes too, like how Sanders did. Gracefully.